Over 60,000 people have been ordered to evacuate an area in the south-east of Louisiana because a dam has been damaged by Hurricane Isaac. People live downstream of the Lake Tangipahoa Dam in Mississippi, which has been damaged but is currently intact. Isaac, now a tropical storm, dumped huge amounts of rain in recent days. Officials are worried the broken dam, some 100 miles (161 km) north of New Orleans, could add to a swollen river. Tangipahoa Parish President Gordon Burgess told local broadcaster WWL that Louisiana Governor Bobby Jindal had ordered buses to the area to help evacuate residents. Over 7,000 National Guard troops, the US reserve armed forces, have been called into service across four states, the majority in Louisiana. Bobby Jindal activated all Louisiana Guardsmen on Wednesday, which would bring total forces in the state to more than 8,000. They have helped rescue or evacuate more than 3,000 people in the state since the storm hit. In the town of Amite, Louisiana, Police Chief Jerry Trabona said officers were going door-to-door to houses along the Tangipahoa River. On Twitter, Louisiana officials quoted state Governor Bobby Jindal as saying Mississippi was considering a “controlled breach” of the dam to relieve pressure. Although no longer a hurricane, Isaac still poses a threat to life because of storm surges, floods and tornadoes, the National Hurricane Center says. At 13:00 local time, Isaac was 25 km (40 miles) south-west of Monroe, Louisiana, moving at 9 mph (15 km/h), according to the National Hurricane Center. 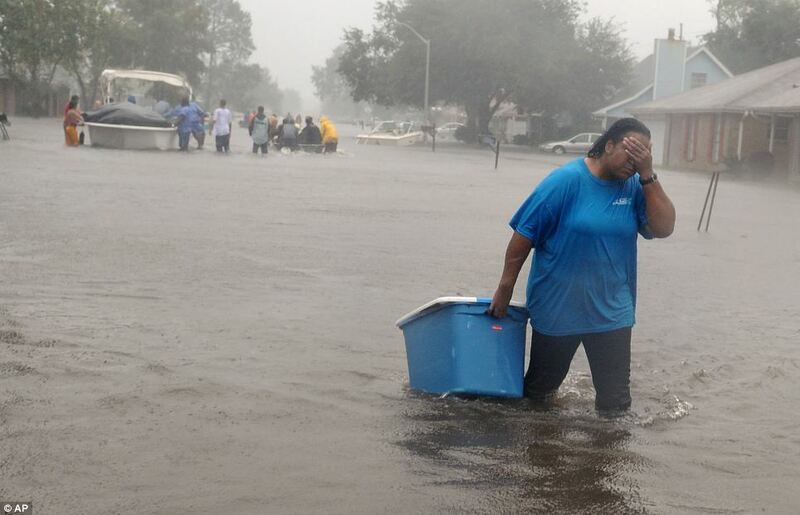 The storm struck New Orleans on Wednesday, on the seven year anniversary of Hurricane Katrina, which devastated the region and killed at least 1,800 people in the Gulf Coast area. Defence systems built to protect the city passed their first major test, according to the US Army Corps of Engineers. But along the shores of Lake Ponchartrain, just north of the New Orleans, dozens of buses and high-water vehicles were sent to evacuate some 3,000 people as waters rose fast – it was waist-high in some areas, the Associated Press news agency reports. In one of the hardest-hit areas, Plaquemines, local boatmen plucked people from the roofs of their homes, many of whom had remained believing they could ride out what seemed a far smaller storm than Katrina. President Barack Obama has declared a state of emergency in Louisiana and Mississippi, allowing federal funds to be released to local authorities. By Thursday morning, more than one million residents of Louisiana and Mississippi were without power due to Isaac, according to the US department of energy. Isaac is expected to move further inland over the next several days before breaking up during the weekend. The storm killed at least 24 people as it passed over Haiti and the Dominican Republic earlier this week.